The Appian Way was one of the first and most important long Roman roads of the ancient Roman Republic, connecting Rome to southern Italy. It was named after Appius Claudius Caecus, the Roman censor who began and completed the first 35-mile-long section as a military road to the south in 312 BC during the Samnite Wars in order to allow troops and supplies to travel into and out of war zones quickly, and he built it straight as an arrow for maximum efficiency. To this day the Via Appia contains the longest stretch of straight road in Europe, totaling 39 miles. Before this, routes southward from Rome went through marshes which made travel difficult and resupply impossible. The road was initially made of leveled dirt upon which small stones were laid, followed by gravel, and finally tight-fitting interlocking stones to provide a flat surface, slightly crowned in the middle for water runoff. Ditches were dug on either side of the road and were protected by retaining walls. Lime cement was later used in the joints between stones to provide an extremely smooth surface, but that cement has eroded away leaving a rough surface today. The road was soon extended to go to Capua, near Naples, and finally reached a total of over 400 miles to the port city of Brindisi at the south of Italy, from which ships sailed east to Greece and Egypt. 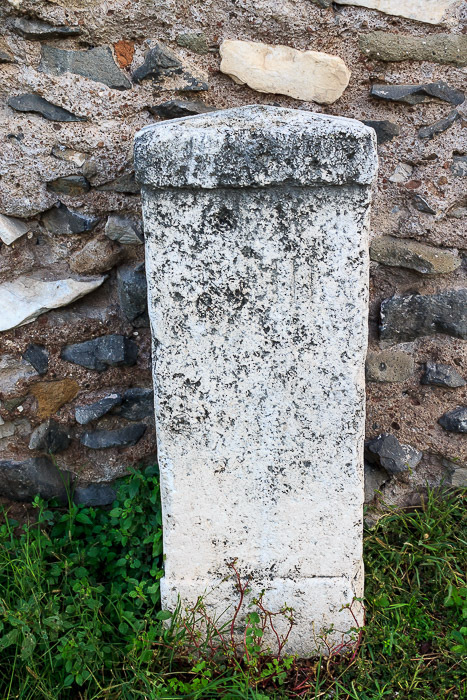 Milestones were eventually added to the road, counting miles south from the road's beginning in Rome. The slave revolt of Spartacus ended poorly for Spartacus' men when after their defeat, 6000 of them were crucified along the 120-mile-long Via Appia from Rome to Capua in 71 BC. Their crucifixion along the Appian Way was ordered, but the removal of their bodies after death was not, resulting in a very effective warning for future revolts. After the fall of the western Roman Empire the road fell out of use. A new Appian Way named Via Appia Nuova was built in parallel with the old one in 1784 and the old one was renamed Via Appia Antica for clarity. Via Appia Antica was used as part of the men's marathon course of the 1960 Summer Olympics, and the part close to Rome is now a free tourist attraction. 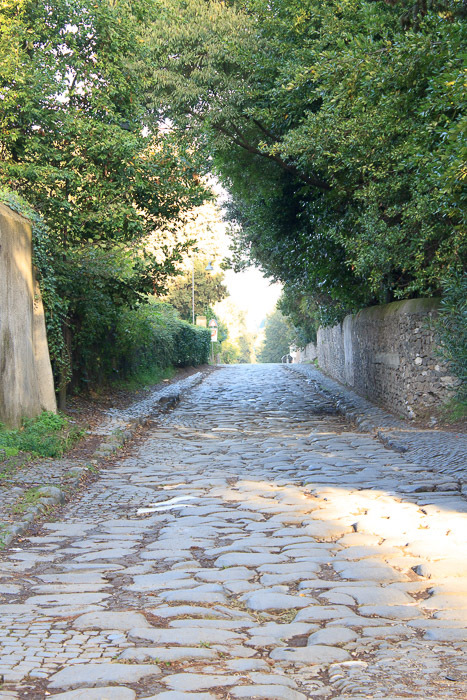 The first 2 miles of Via Appia Antica are still heavily used by cars and buses, and are best avoided by pedestrians. The road starts near the Baths of Caracalla as the street named Via di Porta Sebastiano, and passes under the Porta San Sebastiano gate in the Aurelian Wall and the Arch of Drusus, where its name officially changes into Via Appia Antica. Once the road crosses under the gate, it is outside the city walls, where burials were permitted. We'll be seeing a lot of tombs from here on out. But first, a mile south of the gate is the church of Domine Quo Vadis. From here, it is about another mile to the Catacombs of San Callisto. If you walk from the church to the catacombs, don't walk on Via Appia Antica because during this stretch it is a pedestrian death-trap speedway with tall walls right at the edges of the road and no space for a sidewalk, and the cars go really fast. Instead, at the church, take the path to the catacombs; it's the center road of the 3-way fork of roads heading south right in front of the church. It's closed on Wednesdays since the catacomb also is closed then. The memorial site of Fosse Ardeantine is near the catacombs, at the intersection of Via di Sette Chiese and Via Adreantina. This is a memorial to Italians massacred by Nazis during World War II. Then, it's another mile south to the Catacombs of San Sebastiano. Both catacombs contain miles of underground tunnels where the early Christians buried their dead and occasionally held underground church services. For all of these sights, bus #118 is convenient since it stops at each of them. That bus runs from the Piramide metro stop, to the Circo Massimo metro stop, to the Baths of Caracalla, then Porta San Sebastiano, then Domine Quo Vadis, then the Catacombs of San Callisto, and finally the Catacombs of San Sebastiano. If you have an unlimited daily, 3-day or 7-day metro pass, you can hop on and hop off at each site. Depending on the time you have available, you might want to skip some of these early sights so you can see the ones that follow. I recommend that you definitely see the Baths of Caracalla, and one of the catacombs. Bus 118 does not go further south than the Catacombs of San Sebastiano. But from there, the traffic has thinned out quite a bit and there is space on the side of the road to walk. Just a short walk south from the catacombs is the Circus of Maxentius, the best preserved racing track from imperial times. Another short walk south takes you to a large round tomb. Outside the city walls, where burials were permitted, the Appian Way is lined with burial tombs, some still visible today, some as large as a house, built by important people for their entire family. The Tomb of Cecilia Metella is a great example. A restaurant and bike rental shop is just a bit south, and from here the road is paved with the authentic Roman stones. You can walk or ride a bike for many miles passing the remains of numerous historic tombs. It is 1.5 miles from this spot to the Via di Tor Carbone, a space in which you'll see many tombs. If you're up for an extra 1.5 miles, you can see many more on the way to the railroad track crossing at Via del Casale Rotondo. The road inspired the climactic movement of the Pines of Rome piece of Ottorino Respighi's Roman Trilogy, in which the tremendous marching force of a victorious Roman army marching back to Rome is depicted.